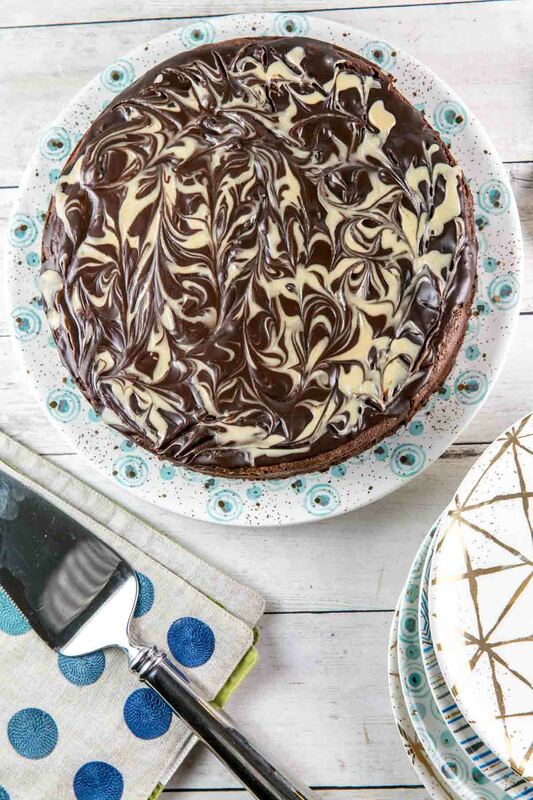 Rich, smooth, decadent, and covered in beautiful spirals of tehina, this flourless chocolate tahini cake is the perfect gluten-free, make ahead dessert. Perfect for Passover dessert, too! 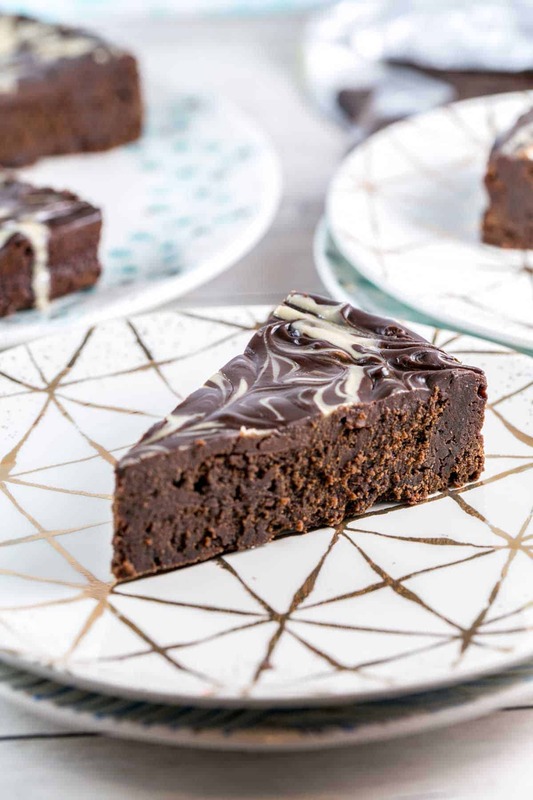 Last month, I shared a recipe for brownies with salted tahini buttercream. I mentioned that I am in the middle of a legitimate tehina obsession right now and can’t stop putting it on and in everything. And excitingly, many of you guys are the same way! I’ve had so many Instagram and Facebook comments about how much everyone loves tehina. Woohoo! 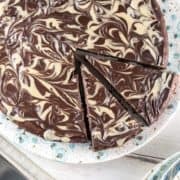 So let’s get back in the kitchen and make another tehina-based dessert: this incredibly rich, fudgy, downright decadent flourless chocolate tahini cake. In case you, too, are in denial about how quickly March is flying by and haven’t looked at your calendar: Passover starts in less than 2 weeks. Um, what?! How is that even possible! Well, I’ll help get you ready… at least when it comes to dessert (which is the most important part of any holiday celebration, right?). Of course, to clarify: tahini is made from sesame seeds. Sesame seeds are kitniyot. 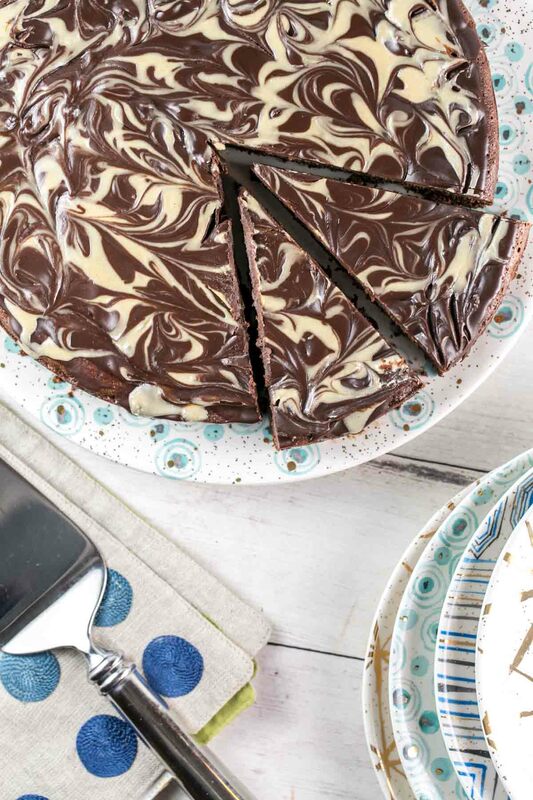 If you do not eat kitniyot during Passover, save this amazing cake for later, and make this flourless chocolate ganache cake instead. If you have no idea what kitniyot is, make this cake anytime you’d like! And to make a very long story short: during Passover, we refrain from eating chametz: wheat, spelt, barley, oats, or rye. Traditionally, if you are of Ashkenazi (European) descent, you also refrained from eating kitniyot: legumes, rice, corn, sunflower seeds, sesame seeds, soybeans, peas, lentils, etc. However, over the past few years… kitniyot has become more widely accepted. In 2015, the Committee on Jewish Law and Standards deemed it was acceptable to eat kitniyot during Passover. Some people embraced this openly; many still refrain because of tradition. Phew. 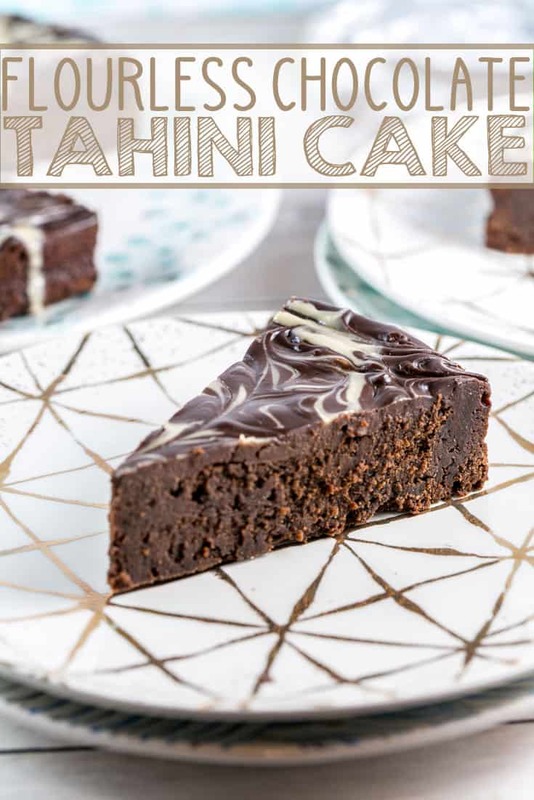 Now that we have that cleared up, if you are tahini-obsessed, looking for an A++ gluten free cake option, or eat kitniyot on Passover, this flourless chocolate tahini cake is for you. Like all flourless chocolate cakes, it is dense and rich and incredibly decadent: a little piece goes a long way. 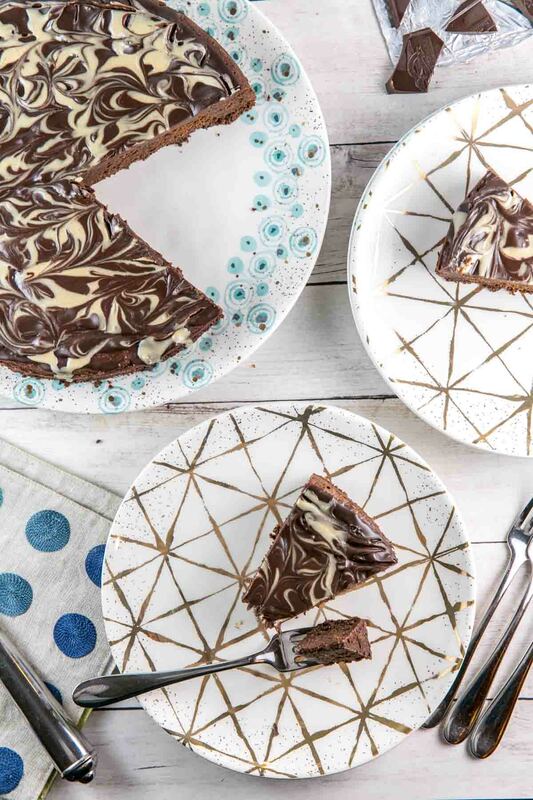 Unlike most flourless chocolate cakes, this one has a slight tahini flavor and is covered with a beautiful chocolate and tahini swirled glaze. Flourless chocolate cakes are really easy to make, but there are a few key things that make the difference between a great one and a not-so-great one. First up, use high quality chocolate (Guittard bittersweet chocolate is my favorite). Use a whole bar and chop it up yourself: this is not the time for chocolate chips with additional stabilizers. Secondly, do not overbake. The cake will still look wet and batter will stick to a toothpick. This is good! If you wait until a toothpick comes out clean, like a normal cake, a flourless cake will be dry and crumbly. Finally, chill the cake when you’re done to finish setting it. 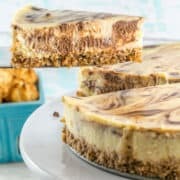 Other things I love about this cake, in addition to the rich flavor and silky smooth texture: it’s perfect to make ahead! Bake the cake and freeze it for up to 3 months. Thaw overnight in the refrigerator. Whether frozen or not, bring the cake to room temperature for 30 minutes to an hour before serving. Gluten free, Passover friendly, easy to make, tahini-filled, make ahead, rich and decadent. I could go on, but I’ll stop here. 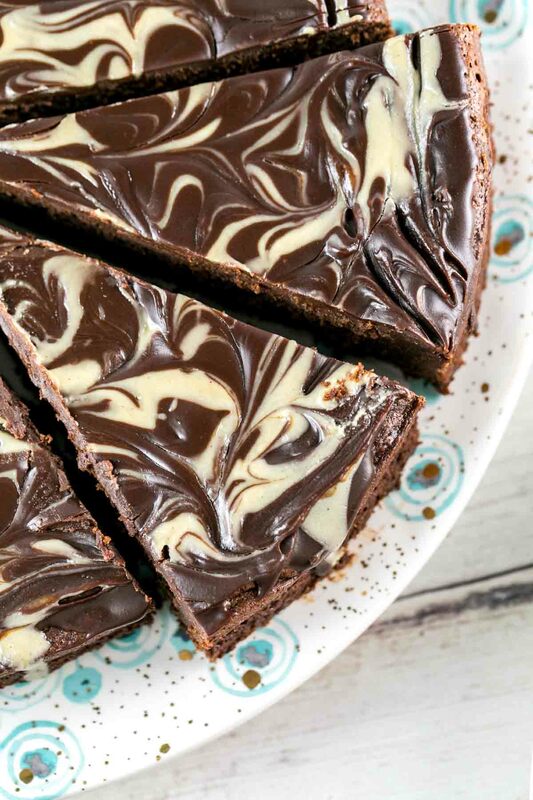 Basically, you need this flourless chocolate tahini cake in your life. Immediately. 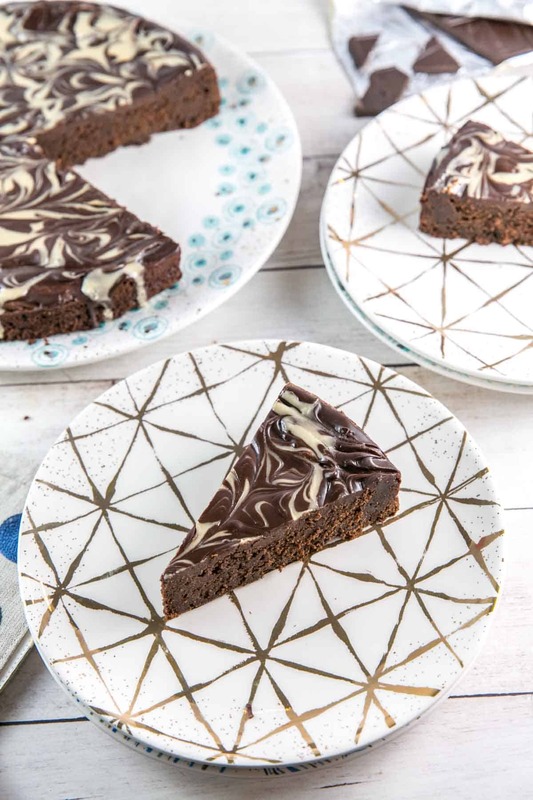 Rich, smooth, decadent, and covered in beautiful spirals of tehina, this flourless chocolate tahini cake is the perfect gluten-free, make ahead dessert. Heat the oven to 300 °F. Thoroughly gease the bottom and sides of a 9″ springform pan. 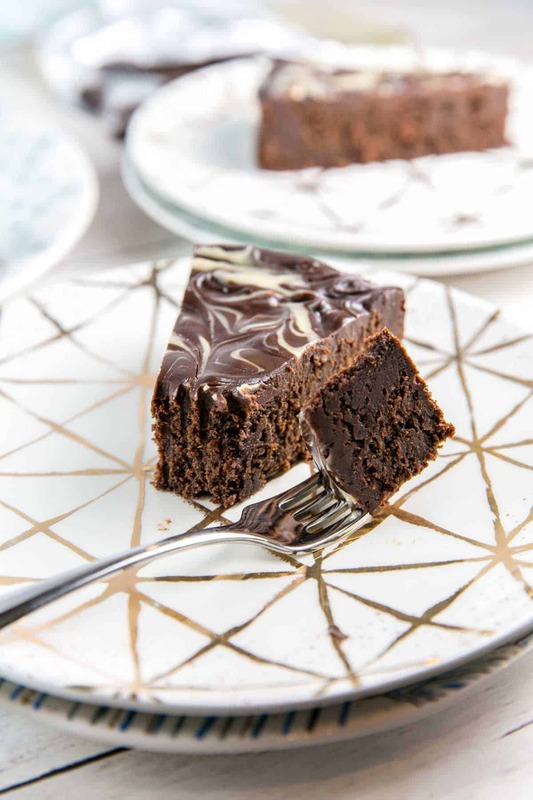 To make the cake, melt together the chocolate and butter in the microwave in 30 second increments, stirring well each time, until fully melted and smooth. Set aside to cool. Using an electric mixer with the whisk attachment, beat together the eggs, sugar, vanilla, and salt. Beat on medium-high speed for 3 to 5 minutes, until the mixture is pale, foamy, and doubled in size. Reduce the speed to low and pour in the chocolate mixture and the tahini, beating for an additional minute until well combined. Add the cocoa powder and mix an additional 30 seconds. Pour the batter into the prepared pan. Bake for 45 to 50 minutes, until the sides of the cake are set but the middle is still jiggly. Remove from the oven and cool in the pan for 30 minutes. Run a knife around the edge of the springform pan, then unmold and transfer to a wire rack to cool completely. Refrigerate the cake for a few hours (up to 5 days). To make the glaze, combine the chocolate and heavy cream in a small microwaveable bowl. Microwave for 30 second increments, stirring after each, until smooth. Pour the glaze over the cake and spread to the edge with a spoon or offset spatula. Drizzle the tahini over the glaze, then swirl with a knife or toothpick. Refrigerate the cake for an additional hour to set the ganache. To make ahead, prepare the cake as directed. Once the ganache has set, wrap the cake in a layer of plastic wrap, followed by a layer of aluminum foil. Store the cake in the freezer for up to 3 months. Thaw overnight in the refrigerator to thaw. Bring cake to room temperature for 30 minutes before serving. Tahini and chocolate is my new favorite combo. I honestly think it’s better than peanut butter and chocolate — and that is clearly saying a lot! This combo is something new to me. Sounds so yum and looks so pretty ! I wish I was eating a slice of this right now! 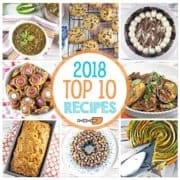 It looks awesome…I love the ingredients and I’d like to give it a try sometime! That cake does look very rich and decadent! Such a yummy slice, makes me want to have a piece! I did not know about the Passover restrictions, thank you for explaining it to us. 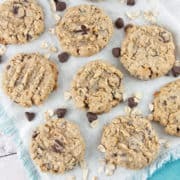 And a big yes to tahini in baked goods!! This cake is so gorgeous! I love the marble top, it’s lovely! 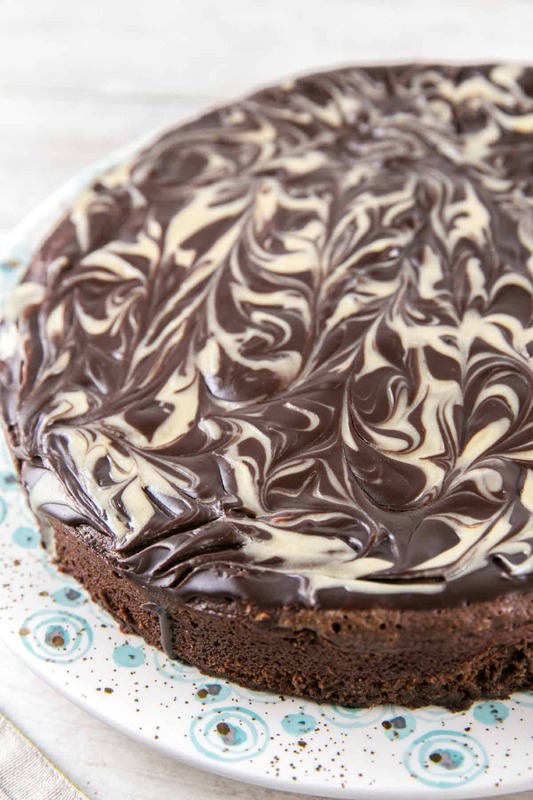 This looks so rich and decadent – I’m going to have to give this a shot REALLY soon! Julie, this cake is gorgeous and so rich and dense looking. I’m actually pretty happy I don’t know what kitniyot is which means I can make this anytime! 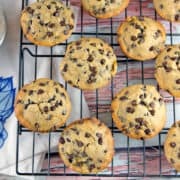 I’ve only use tahini in cookies, never in cake but I’d love to try it! It even looks fairly easy for a non-baker like me! What a gorgeous cake and I absolutely love that there’s tahini in it! It looks pretty easy, too, so I’m definitely adding it to my list! The texture on this cake looks amazing! And that swirl is just gorgeous. Thanks for the info about kitniyot – I found it super fascinating to learn about! This looks sinful! 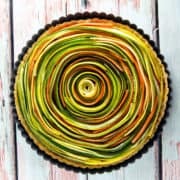 And the design is mesmerizing, it’s entrancing me to eat it all. This will be a great recipe for my next girl’s night. 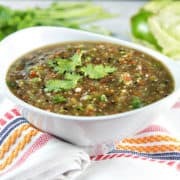 This is such an interesting recipe. It’s a great idea to include protein-packed tahini in it. And I really love the frosting and always wondered how to make this. Thanks for this great recipe. Pinning! I am intrigued. First, I’ve never heard of a flourless cake. Second, I would love the denseness of a chocolate cake. 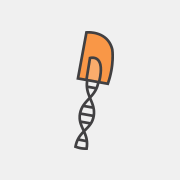 Hmm…. 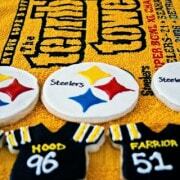 I might make this today.